1) Roxanne shares her laundry detergent recipe -- something I may just have to try because I too dislike the "smelly" detergents of today (such strong smells make me thing they want to cover-up stink, as opposed to clean & remove odors). 2) Found at Roxanne's blog, Letting it All Hang Out, by Wendy Priesnitz, on joys of using your clothesline to dry your laundry. 3) Chloe compiles her "De-Stash Challenge" posts to help de-clutter your sewing room. 4) Get kids interested in cooking with this silly science measuring cup! 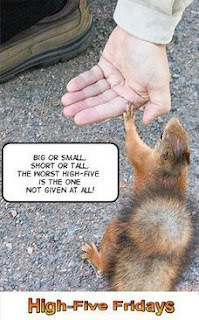 Thanks for the "High-Five" about my blog! Yes--I LOVE the laundry detergent doing it's job and making things smell just plain clean. Sometimes I do add an essential oil, but it's mostly to make the house smell nice while I'm doing laundry.